Amplifier is an electronic device which basically boost up the strength of the weak signal and converts it into a strong signal. 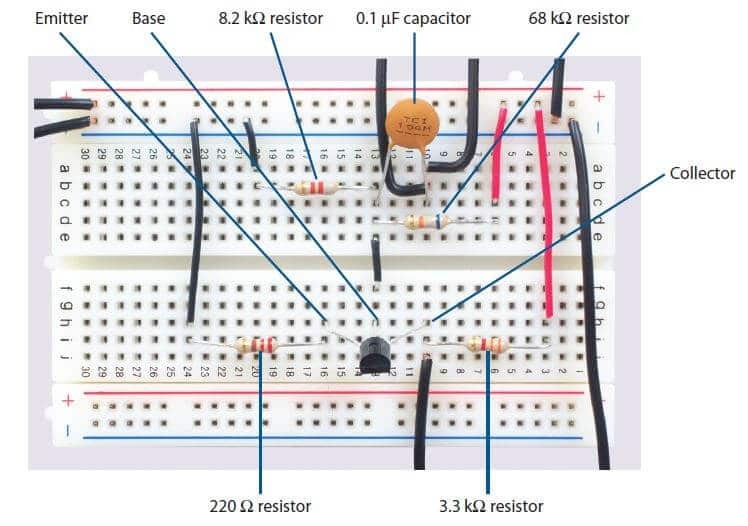 We have covered transistor configurations and its working in our previous articles. Here we going to put some shadow on how transistor works as an amplifier. We can use a transistor as an amplifier by raising the strength of the weak signal. 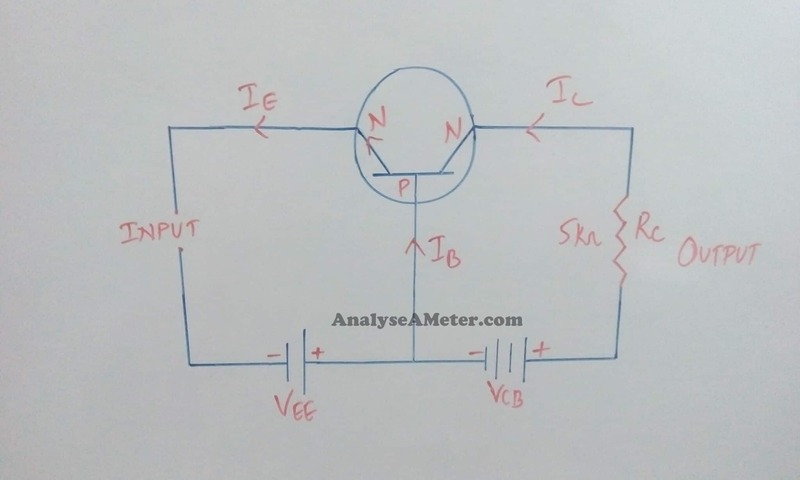 With the help of suitable diagram, we explain you how transistor circuit acts as an amplifier. The Figure given below shows the basic circuit of a transistor amplifier. As shown in the figure above, we apply input signal or the weak signal between the emitter-base junction and takes the output across the load Rc connected in the collector circuit. For faithful amplification, always ensure that the input circuit is forward-biased and the output circuit is reverse-biased. For this purpose, we apply d.c voltage i.e. VEE in the input circuit in addition to the signal as shown in the figure above. This d.c voltage is known as a bias voltage and its magnitude is such that it always keeps the input circuit forward biased despite the polarity of the signal. As we know the input circuit has low resistance, consequently, a small change in the signal voltage occurs at the input circuit lead to an appreciable change in the emitter current. Due to transistor action, change in emitter current causes a similar change in the collector circuit. Now, the collector current flowing through a high load resistance Rc produces a large voltage across it. Thus, the weak signal applied in the input circuit appears in the amplified form in the collector circuit. 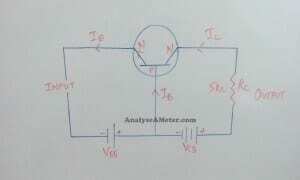 In this way, transistor acts an amplifier. Generally in most electronic circuits, we use most common circuit configuration for an NPN transistor i.e. Common emitter Amplifier circuit. Let us consider a single stage common emitter amplifier circuit which is commonly known as Voltage divider biasing circuit. This biasing arrangement basically uses two resistors as a potential divider network across the supply, with their center point it supplies the required base bias voltage to the transistor. This type of biasing is commonly used in the design of bipolar transistor amplifier circuits. In this type of biasing, transistor greatly reduces the effect of current amplification factor β by holding the base bias at a constant steady voltage level and allows accurate stability. The base voltage Vb is calculated by the potential divider network formed by the two resistors and the power supply voltage Vcc. The same supply voltage also determines the maximum collector current, when the transistor is switched “Fully-on” i.e. in saturation mode. Note: β has no units, as it is a fixed ratio of two currents, Ic and Ib so a small change in the base current will cause a large change in the collector current. Common emitter voltage gain is equal to the ratio of the change in the input voltage to the change in the amplifier output voltage. Consider Vout as Δ VL and Vin as Δ VB. 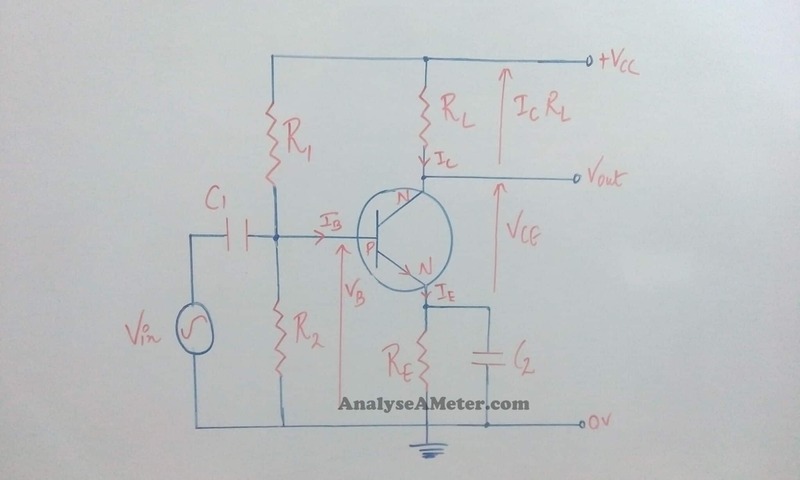 With the help of above equation, you can easily calculate voltage gain of common emitter circuit. With these formulas, you can easily calculates voltage gain of an amplifier circuit. The action of the transistor as an amplifier can be more illustrative if we consider typical circuit values. Consider a collector load resistance value = 4kΩ. Now assume that a change of 0.1 V of the signal voltage produces a change of 1 mA in emitter current. Because of transistor action it is obvious that the change in emitter current is equal to the change in collector current. Therefore, the change in collector current would also be approximately 1 mA. This collector current flowing through collector load Rc would produce a voltage equals to 4KΩ x 1 mA = 4V. Thus, a change of 0.1V in the signal has caused the change of 4V in the output circuit. Consequently, you can see that the transistor has been able to raise the voltage level of the signal from 0.1V to 4V i.e. 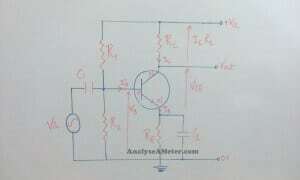 voltage amplification circuit is 40.